For Deaf Catholics, a gesture from Pope Francis meant the world. Pope Francis communicated more with one hand on June 27 than many in the audience had seen in a long time from a church leader. 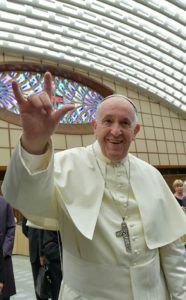 With a smile on his face and his right arm raised in the air, Francis placed his two middle fingers in his palms and signed “I love you.” It was a message for the dozens of young people from North America and Central America who are both Catholic and deaf, and one that has made the life’s work of the Rev. Joseph Mulcrone well worth it. A priest in the Archdiocese of Chicago, Father Mulcrone has been working with deaf Catholics for four decades and said that introducing Catholics who often feel marginalized in the church to the pope ranks at the top of his career. Father Mulcrone is one of the founders of the Deaf Catholic Youth Initiative for the Americas, which serves Catholics who are deaf by providing them a gathering space and by training local pastoral workers, both hearing and deaf. The National Catholic Office for the Deaf estimates there are about 5.4 million deaf or hard-of-hearing Catholics in the United States. But advocates for the deaf Catholic community say the church is not meeting the needs of some of its most marginalized members. In part, that is because there is a paucity of ministers who understand deaf culture. For centuries, deafness was considered a disability that prohibited ordination. That began to change in the 20th century. In 1921, the Rev. Charles La Fonta became the first deaf man to be ordained a Catholic priest. He was required, however, to learn to pronounce the words of the Latin Mass, and his public ministry was limited. The Rev. Thomas Coughlin was the first man born deaf to be ordained a priest in the United States, in 1977, and today there are still only about 14 priests in the world who are deaf, with more than half of them here in the United States. Catholic bishops in the United States released a document about disability in 1978, in which they urged parishes to include sign language interpreters at Masses and to invite deaf people to serve as extraordinary ministers of Holy Communion. Then in 1995, the bishops released a longer document that laid out more rights for Catholics who are deaf. It stipulated that deaf Catholics “should have the opportunity to confess to a priest able to communicate with them in sign language” or to use an interpreter in confession. The Rev. Christopher Klusman was ordained a priest in 2011, and he immediately began ministering to Catholics who are deaf. The Milwaukee priest said that as a member of the deaf community himself, he is able to offer deaf Catholics homilies and resources that will resonate with their own faith journeys, which often takes more than just providing a translator. “What works for the hearing community doesn’t always ‘fit’ the deaf community and vice versa.”“What works for the hearing community doesn’t always ‘fit’ the deaf community and vice versa,” he said. He says his ministry is guided by a riff on a well-known Gospel passage. “How can I, as a shepherd for the deaf, not run to search for that one deaf sheep and bring him or her back into the flock?” he asked. Another deaf priest, the Rev. Shawn Carey from the Archdiocese of Boston, said deaf Catholics need similar catechetical resources as hearing people. By incorporating deaf Catholics into parish life, the entire community is enriched. While many Catholics may have experienced Mass being celebrated by a hearing priest with an interpreter for the deaf community, Father Carey celebrates Mass and preaches using American Sign Language, with a voice interpreter for those who hear. He said hearing parishioners have come up to him after to say how powerful the experience was for them. “Most people just read the Gospel, but now they’re seeing it, they’re seeing the hand moves, and they feel more included in the story,” he said. Audrey Seah believes the church should treat American Sign Language as a vernacular, like it does with English, Spanish, French and many other languages. “There’s a richness in A.S.L. that English doesn’t have,” Ms. Seah told America. She is studying the role of visual language in the church at the University of Notre Dame. She offered as an example the theological concept of the trinity, something even the most articulate pastor can find difficult to convey. Father Carey agrees, and he said hearing people have told him they were especially moved when he used A.S.L. during Good Friday services. “They say, ‘I was touched. I feel like I was in a movie. It was really brought to life,’” he said. Ms. Seah, who is hearing, said providing the sacraments in A.S.L. is a matter of justice for deaf Catholics, who, even when provided resources, are nonetheless sometimes literally marginalized. They are often asked to sit off to the side of a church, where an interpreter is sometimes placed. She said this can make participating in the Mass difficult for deaf Catholics. Maryann Barth is a deaf Catholic who lives in Kentucky. She said many deaf Catholics do not feel welcome because parishes often lack resources to serve them. “Deaf people are ‘eye’ people, not ‘ear’ people, and to fully understand, appreciate and ‘go forward’ in our spiritual development, must have American Sign Language and deaf Culture in our spiritual lives as well as our daily lives,” Ms. Barth wrote in an email to America. She said the church could have an important role to play in meeting the needs of deaf people, an overwhelming majority of whom are born to hearing families. “Deaf adults become like a ‘family’ to nurture, teach, lead and support deaf children and deaf young adults,” she wrote. Father Mulcrone, who is part of a community that celebrates Mass with the deaf community in Chicago each week, agrees that it is a matter of justice for the church to provide access to the sacraments for Catholics who are deaf. He laments that few parishes have interpreters available to sign Mass and there are even fewer priests proficient in American Sign Language to hear confessions or anoint the sick. In the early 2000s, Father Mulcrone and others involved in deaf ministry marveled at the progress made in the United States for people who are deaf, especially compared with just a few decades before. There were laws, including the Americans with Disabilities Act, to guarantee access to education, technology that could connect them to the hearing world and opportunities to participate more fully in the life of the church. But in other parts of the Americas, in countries such as Mexico, Panama and Guatemala, resources for the deaf were not nearly as robust. So Father Mulcrone convened in 2002 a group of deaf teens and young adults in Miami, from about 16 to 26, and asked them several questions. “What does it mean to be a person? What does it mean to be a deaf person? What does it mean in your context to be a Catholic deaf person?” he recalled asking participants. The facilitators listened, he said, and jotted down notes. Concerns included a lack of employment opportunities, loneliness, feelings of shame and being cut off from the sacraments. Struggles for people who are deaf can include isolation and loneliness, especially if they are not connected to the deaf community, as well as increased vulnerability to abuse. Back in 2010, revelations of sexual abuse of deaf children in a church-affiliated school were made public. The Rev. Lawrence C. Murphy, who died in 1998, is suspected of abusing up to 200 children in his care at St. John’s School for the Deaf in St. Francis, Wis., beginning in the 1950s. Similar cases have been documented in, among other places, Quebec and Argentina. Deaf people often find themselves ignored by both society and the church, and that is why D.C.Y.I.A. decided to go to Rome—or “the center of the church,” as Father Mulcrone put it. The trip came about nine years after a major conference for deaf Catholics held at the Vatican in 2009. Following that meeting, a dozen recommendations about deaf ministry were sent to bishops’ conferences around the world. They included suggestions that priests be trained in deaf culture, that all seminarians take a course about pastoral care for the deaf and that special efforts be made to promote vocations in the deaf community. Michael J. O’Loughlin Michael J. O’Loughlin is the national correspondent for America.